Is there another way to modify the root account or disable this and create a new root account? ps -lp 2104 will give you some information about what the process is. You can check that and kill 2104. Note you'll have to do this logged in as root, or some other user with the permissions to do it. It probably will not work via sudo, etc. You'll also have to rename the home directory. IMO you should just create a new user with whatever name, and leave pi there, but that is up to you. exec tells the shell that instead of spawning off a new process when it runs a command (hence leaving the shell process running as the logged in user), that the shell should overwrite itself with the new process. This means that when the exec command ends the shell is gone. In the case of a login shell, that equates to disconnecting from the login. the cd / is optional. At a minimum, things get a bit confusing if you move a directory you're in (your login starts out sitting in the user pi home directory). Sometimes this will cause a fail, so it's better to be safe than sorry. Therefore with exec sudo -s you're overwriting your shell with a new shell that has been created as a different user (the root user in this case). P.S. be sure to give usermod -d a full (hard link) path or you'll end up moving the account's home to somewhere you don't expect and have a bogus directory entry in passwd. Log/ssh into pi as root using ridiculous password. Now you should reset root so others can't brute-force your ridiculous password. Then you'll have to change any additional changes in any scripts/setups that refer to 'pi'... JOY. The answers above are correct, I just want to give another option that may suits you better. Step 1: stop user pi from running before the change. After ALT+F1, you should see a login question (and not an autologin). Login as root with your root password. Now you are alone in the system, and changes to pi will not be met with usermod: user pi is currently used by process 2104. Check with ps -u pi to see an empty list. Very carefully, key by key, type usermod -l mypie pi . This will change your username, from /etc/passwd file, but things are not ready yet. Anyway, check with tail /etc/passwd and see the last line mypie:1000:... The 1000 is the UID and it is now yours. Try su mypie just to be sure. Do nothing. Just exit again to root. It should work. Now you need to adjust the group and a $HOME folder. Type, again carefully, groupmod -n mypie pi . This will change the pi group name. Check it with tail /etc/group and you will see the last line the new name associated with GID 1000. Just to clarify, type ls -la /home/pi and you will see that the pi HOME now belongs to you, mypie. Step 4: lets adopt the new home. I see in the answers above the creation of a new folder, copying everything. No need. Lets just use the same. Type carefully: mv pi mypie . You now need to associate this change with your new user. Type carefully: usermod -d /home/mypie mypie . This will change your home directory. Check it with tail /etc/passwd and look at the sixth field (separated by :). Step 5: some adjusts after the fact. Login as your new user mypie in the graphical interface. Type sudo su - and you will be asked your password. Open it vim 010_mypie_nopasswd and change the line pi ALL=(ALL) NOPASSWD: ALL to, obviously mypie ALL=(ALL) NOPASSWD: ALL. It is read-only, so save it forcing with :x! Edit $vim /etc/hosts and change 127.0.1.1 raspberry to something more appropriate like 127.0.1.1 myoven. Edit $vim /etc/hostname and let a single line with myoven. You may want to do this via ssh. For this to work, first you need to allow root login. After you have done it, undo this changes as they are too dangerous to let that way. Note 1: This is a guide, and the content deals with very dangerous commands. Backup first, or be aware that maybe you will need to burn again your image. As I am assuming a brand new raspberry pi, there is not much to backup anyway. But if you adapt it to another situation, be advised. Note 2: There might be more things to change. 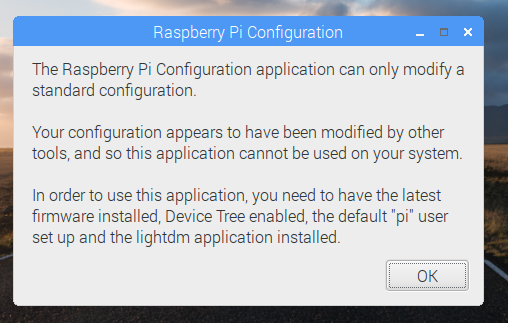 As I am new to the Raspberry pi (I got mine 2 days ago), I may find other adjusts I left out and I will edit this answer again. Note 3: My first attempt was to move pi user and pi group to another UID and GID (1001) and create a new user for me as 1000. That didn't quite go as I planned and I needed to burn my SD card again after spending the whole day trying to figure out why the "configure you pi" program would not work anymore. But well, this way here is far easier anyway, so here you go: a new pi with just your username as UID 1000 (and all the good stuff in your home). Note 4: Be advised, after doing that, the standard configuration tool stops working. footnote: Thanks for the stackexchange raspberrypi community (as I'm new here also). How to change default username on Raspberry Pi when connected via ssh? How do I access the distribution's name on the command line?